The stigma is deep-rooted and it took centuries for us to understand the importance of mental wellbeing. It took infinite lives and millions of people to raise the voice to create awareness on mental health. It is a bitter truth to know the misconception of mental illness still prevails in our society. In keeping with Gandhi’s words, “You must be the change you want to see in the world” Together, let’s fight the stigma of mental illness for a better society and a better tomorrow. With a great initiative to create awareness on Mental Health, we strive to gather people who are working in different parts of the world to join us for a cause. Euro Mental Health is an annual international event with speakers from different countries share their ideas and innovations for a better tomorrow. For the first time in history, we invite public participation with extraordinary stories to create a worldwide impact. Our aim is to create an international platform for the rightful, to help them and make the world hear their voice. Research in Psychiatry is highly progressive that it seems impossible to predict a year ahead. Many of the programs that managed were based on community settings. Psychiatry is a unique specialty with some very formidable challenges. The discussion of the future of psychiatry will focus on 5 interrelated areas: workforce, access, stigma, research, ethics and public perception. 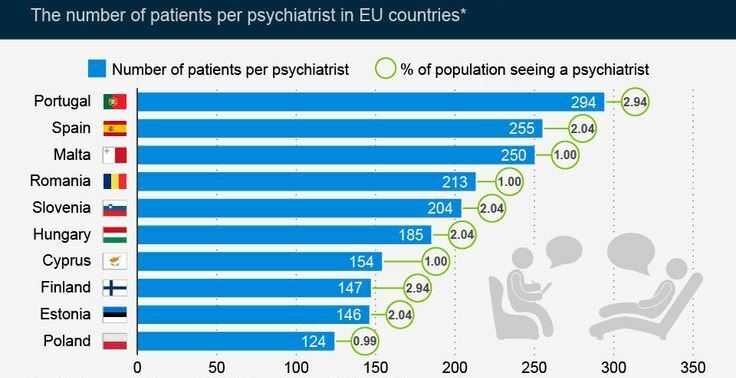 There is a serious crisis in psychiatry workforce, there are far too few psychiatrists, and large parts of the country especially rural and inner city areas have very few. Many studies over the years, including reports from presidential commissions, surgeons general the Council of Graduate Medical Education, and the Institute of Medicine, attest to the dire shortage of psychiatrists relative to the almost 68% of nation's sufferers who are deemed in need of care. This shortage embraces all mental health. Projections from the studies mentioned above estimate a need for 30,000 by psychiatrists by 2018 but currently, there are about 6000. Resulting in part from recent efforts by the American Academy of Psychiatry we will see a modest 30% increase in the number of medical students and general psychiatry residents choosing psychiatry as a career. Isn’t it would be great to have a hot cup of chocolate in a cold Amsterdam morning and networking with the peers?! Euro Mental Health aims to give you a world-class conference with an unforgettable journey. Our conference is not only about meeting extraordinary people but to create an unforgettable memory. We will be happy to help you in all regards to plan your trip to Amsterdam. Avail the official invitation letter, accommodation letter and all necessary documents from us to attend this event and ahead with a closer step for approval of your VISA. In June, summer has arrived and Amsterdam is abuzz with action through the long days and warm nights. Canals are bustling with boats and terraces are filled late into the evening. June also kicks off a busy festival period. Open air music festivals fill the air with grooves and theatre festivals bring a cultural explosion to the city. The bond we created in Paris last year, invites our past congress attendees to join us this year in Amsterdam. You are warmly welcomed with your family to meet us in Amsterdam, Netherlands.